EURUSD was chiefly under the influence of European Commission President Jean-Claude Juncker and U.S. President Donald Trump talks about the tariffs yesterday and today the eyes are on the ECB Interest Rate Decision. 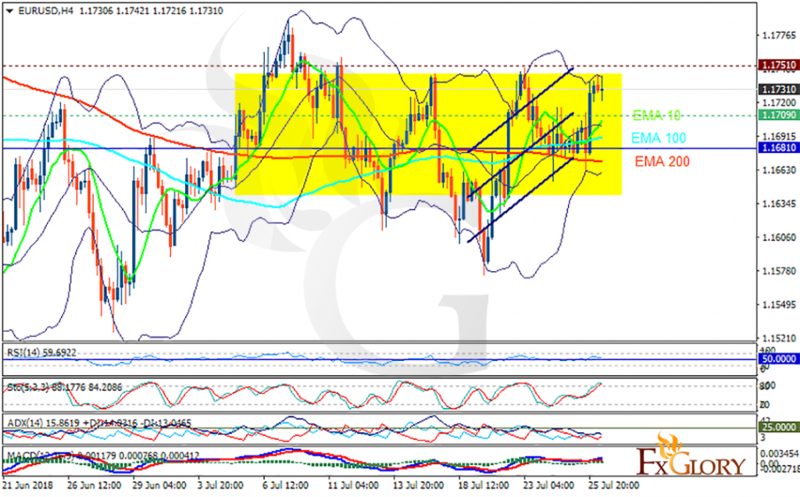 The support rests at 1.17090 with resistance at 1.17510 which both lines are above the weekly pivot point at 1.16810. The EMA of 10 is moving with bullish bias in the ascendant channel and it is above the EMA of 200 and the EMA of 100. The RSI is moving above the 50 level, the Stochastic is moving in high ranges and the MACD line is above the signal line in the positive territory. The ADX is not showing any clear signals. Long positions are recommended towards 1.175.